Carson Leslie poured out his heart in a journal during his 3 year battle with brain cancer. As he got weaker, he asked his English teacher to help him put his thoughts on paper and then negotiated that his journal be his passing grade for freshman English. 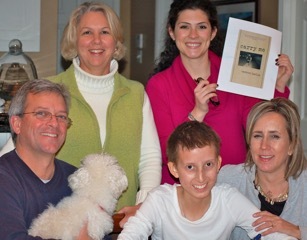 Finally, when cancer was relentless, he asked that his journal be published “to give a voice to the teenagers and children who have cancer but are unable to express how such an illness affects their personal, social, physical and emotional life. I want others to understand how to be a better friend to someone he/she knows.” At lightning speed, six days before he died, Jan Miller of Dupree Miller, published Carry Me. Since then, Carry Me has found a place on the hallowed shelves of The Library of Congress. Thousands of copies have sold with proceeds going to encourage teens in the battle at Children’s Medical Center of Dallas and to study the disease that invaded Carson’s brain and claimed his young life. On North Texas Giving Day, September 22, Carry Me will be on display at The Library of Congress at the Congressional Childhood Cancer Caucus, Golden Toast, an event that honors the Co-Chairmen of the Childhood Cancer Caucus. So with inspiration from Carson and a host of generous souls, the Carson Leslie Foundation built Carson’s Corner, the teen room on the cancer floor at Children’s Medical Center of Dallas. It’s a little corner on the cancer floor where cancer fighting teens can walk or wheel down to talk about the weather, music, movies, treatment or anything else. 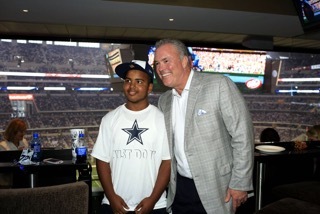 Stephen Jones provided the suite where he hung out with the Carson Leslie Foundation’s group of cancer-fighting teens during our outing to The Dallas Cowboy game. To keep Carson’s Corner current with technology, games, updates to the room and gifts of encouragement for the over 400 teens annually treated at Children’s Medical Center of Dallas we need your help. We also provide Under Armor backpacks for newly diagnosed teen patients full of items needed for extended hospital stays and we need your help. 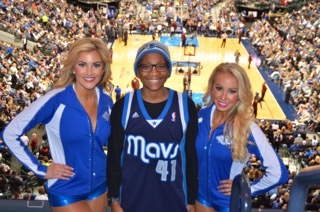 In addition to providing the suite, Donnie Nelson made magic happen for the Carson Leslie Foundation’s group of cancer fighting teens during our outing at The Dallas Mavericks Game. In addition to Carson’s Corner and Under Armor backpacks, three times a year, in first class fashion, we take cancer fighting teens from Children’s Medical Center of Dallas out and about our great city in limos, to suites complete with food, drinks, souvenirs, smiles and memories to a Dallas Cowboy game, a Dallas Maverick game and a Texas Ranger game. We need your help! Carson lived his whole short life in North Texas and we need your help encouraging teens in their battle for life. To donate to Carson Leslie Foundation on September 22nd, please click here. To find out more about North Texas Giving Day, please visit www.NorthTexasGivingDay.org.